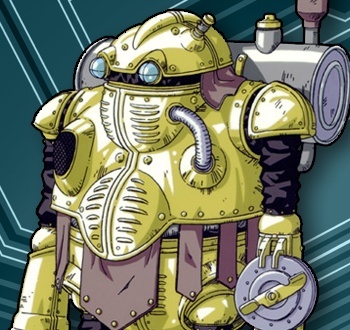 For all robots may be infallible and superhuman, the ones we most fondly remember are the ones who are flawed - like Chrono Trigger's Robo. I'm not going to lie - the original Chrono Trigger remains one of my personal favorite games of all time, and its simple but intriguing story is bolstered by a roster of compelling (sorry, guys) characters, particularly the one non-human member of your party. After finding the broken-down robot in a dismal apocalyptic future, you repair him and name him Robo, and it is his journey that is perhaps the most interesting one of all, as Brendan Main argues in Issue 225 of The Escapist - because it is an exploration of the flaws that give a mechanical creation genuine humanity. Robo's altruism raises a question of ethics. Left to its programming, a robot is liberated from the ambiguity of free will; it simply does as it is designed to do. Even Isaac Asimov's famous laws, which dictate whom a robot can or cannot harm, serve to defer morality. Hardwired according to these restrictions, a robot may be civil, but it cannot be kind. Robo, on the other hand, behaves for no reasons but his own. He chooses to be good - and is prepared to suffer the consequences. Throughout the story he is smashed, thrown into a garbage chute and crushed between closing doors, but he is always stoic about his fate. Rather than be an impervious hunk of metal, his robotic body seems to invite punishment - he is willing to be torn to pieces, so long as blood isn't spilled. To read more about one of the most memorable robotic characters in all of gaming, read "Electric Soul" by Brendan Main.